The famous Le Grand Rassemblement sculptures at the Centre d'Art Marcel Gagnon in Sainte Flavie on the Gaspe Peninsula, Quebec, Canada.The exhibit has over 100 life sized human forms emerging from the St Lawrence River, at Sainte Flavie. The Le Grand Rassemblement was ever evolving as the artist, Marcel Gagnon, added new figures over a period of time. 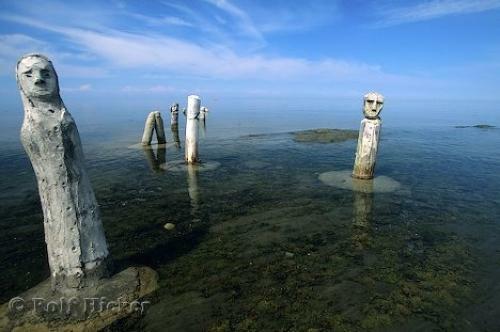 Photo of the Marcel Gagnon sculptures in Sainte Flavie on the Gaspe Peninsula of Quebec, Canada. Pictures from photo gallery "Quebec Pictures"
This picture is part of the photo album "Quebec Pictures" - there are more beautiful images waiting for you.